Why I Don’t Trade in Futures, Options or Commodities? As a blogger, I get questions about futures or options or even commodity trading. The answer to them is – I don’t trade in futures and options but when I was new in the market and as a blogger, I was tempted to take on futures or options as well. I did try it out on a very small scale and to an extent into the paper trading but then it wasn’t something that worked for me but side by side technical analysis started working really well for me. 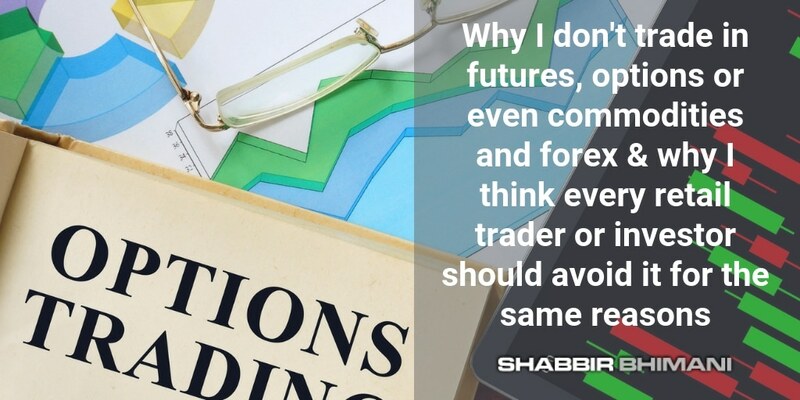 There are reasons I avoid trading in futures or options or even for that matter commodities and I will share each of the reasons. I get better returns on my invested capital from the equity cash segment of trading and investing that I don’t need to be dealing into something else. This is the most significant reason. In fact, I also have very little investment in real estate and one of the main reason being, I can generate better returns investing in equity. In fact, I also sold off one of the commercial property that I had in Kolkata and didn’t invest the money back into the real estate market here in Surat. I invested half into equity markets and only half into the real estate just to keep things diversified. So when you have better than expected returns being generated with investments. There isn’t much need to explore more areas. When I wanted to move away from trading to investment and one of the reasons being the amount of absolute risk involved in trading. I don’t have a finance degree and there are many aspects of futures and options that are beyond what I understand. Call Option Put Option, open interest are some of such terms which I have explained on my blog but when it comes to trading, you need to be able to get trading signals from them and be able to make consistent profits. And If you ask me, I would say I don’t understand them in detail to be able to trade in them and consistent profits. If I can understand and use technical analysis, so if I had to, I may have been able to get into understanding them as well but it is not the need of the hour right at this moment. So I will say it is more like I don’t want to be getting into them somewhere in the back of my mind when the cash segment of the market is working for me the way I want it to. I do programming based work for my clients, I have a couple of blogs (IMTips.co and Shabbir.in) that are doing quite ok and then I have to dedicate some time to invest in the right companies. There is very little time left for me to trade and often I miss trades because of lack of time even in the cash segment. Futures is more of an active trading play than a passive form of investment. Trading involves active involvement and investing is more of a passive involvement. I like to be involved in the passive mode with the market and as and when I have time, I may trade. As a trader, my positions are small and often on the same stock I have an investment because I can follow the upcoming news and events easily. So getting into future or options trading is something that will need more of my time and I don’t have so much time for it. I am against the margin in the market because I have seen people lose a lot of money when they trade with leverage in the market. I don’t like to take a position beyond my capacity but if you use futures, you take up positions that are few times your capital and that can mean you are taking a lot more risk than anticipated. Futures is by default a play with margins. Yes there may be some good points about it as well and some may have used it to their advantage also but that doesn’t mean everybody can take advantage of it. So if you aren’t equipped to take advantage of it, remain away from it. When you have so many things against futures, why does it exists in the first place? Actually, we need to understand why you can take a position in the futures market with a small amount of money. It is meant to hedge your cash market long position. So you have a large investment in the market and you know there is an issue in the short term in the business. It will underperform and may even go down on price. Still, you don’t want to exit on your investment as you know it is a good investment in the very long run. So instead of booking out of the company, one can take a futures short position to hedge the investment. Read more about Hedging here. Now coming back to the example. Let us say you had an investment in a Pharma company in pre-2015 or so. Pharma as a sector went through a change and it is still recovering because of the change in the policy of USFDA and very competitive pricing for the pharma companies in the US. So now when you knew for sure of such news for your investment in the sector but as a long-term investor, you were certain things will be fine in few years so you wanted to hold your position in such downtrend. So one can take a futures bet to minimize losses in the investment. So ideally futures was meant to be dealing with such scenario but today we see people only trade in futures because they can take positions few times their capital and without knowing the risk of capital can completely be wiped off. Similarly, the option is for to deal with many such special scenarios and positions in the market. I don’t think the way I trade or invest in the market is perfect but what is more important is, it works for me based on my availability of time, money, style of trading in the market. If you think you are good to be able to make the most of the futures and options in the market, you should be doing it but if you don’t understand it by and large and aren’t able to consistently profit out of it with paper trading, it is better to sit away from that segment of the market. Even if equity investing is not for you, you can always go the mutual fund route. Even when selecting the right mutual funds, for some highly volatile small-cap funds may work whereas for others it may be more of balanced funds. There is no general rule that only one kind of funds one should be investing because they generate more returns or provide more stability. It is always the risk that one should understand when going for the reward and if it is something you are comfortable taking on, there is no harm in going for it. So though generally, I don’t recommend futures and options to the retail investor, it is up to you to decide if you can give the needed time to actively trade in futures or options in the market and are fine with the risk of it. You are here: Home / Trading / Why I Don’t Trade in Futures, Options or Commodities? 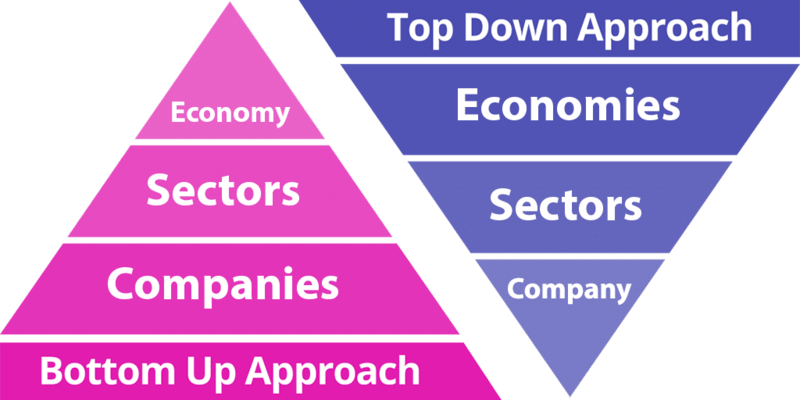 What is Top Down Approach and Bottom Up Approach to Investing?